Perched overlooking picturesque Mackerel Cove and The Back Beach, rests The Beach Rose, a beautiful coastal cottage with stunning westerly ocean views. You'll love spending your mornings on the front porch, watching the lobstermen set out for their day on the water. Your days will be filled with trips to Mackerel Cove to soak up the sun, comb the beach for treasures, and take a refreshing dip in the ocean, coming back to the house for a tasty lunch or exploring one of the island's restaurants to enjoy delicious, fresh seafood, and at the end of the day, you will surely find yourself back on the porch to watch the sunset over the ocean, painting the sky with gorgeous hues of pink, orange, and purple. Inside The Beach Rose, you will find a wonderfully updated home with modern, coastal decor and comfortable furnishings throughout. The first floor offers a well-equipped kitchen, dining area, and a comfortable living room with a wonderful bay window overlooking the ocean. The living room opens to a back deck offering outdoor seating and a grill. On the first floor, you will also find a washer & dryer and a full bathroom. Upstairs, there are three spacious bedrooms with lush, inviting bedding, and a shared full bathroom with a walk-in shower. You'll love the creature comforts throughout the home, making for a wonderfully relaxing vacation by the sea. 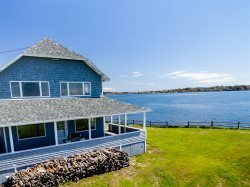 Located in the heart of Bailey Island, you will enjoy being just a short walk/drive away from all the islands have to offer, including Morse's Cribstone Grill (1.2mi away), Cook's Lobster & Ale House (1.3mi), Giant Stairs Seafood Grille (0.4mi), Bailey Island General Store (0.4mi), Land's End Gift Shop (1mi), Salt Cod Cafe (1.5mi), H2Outfitters (1.5mi), Island Candy Company (2mi), and several great local beaches. You will also enjoy being just 20 minutes from all the restaurants, shops, and pubs of Brunswick. Book your Maine vacation at The Beach Rose today and make memories this summer to last a lifetime. Pets are not allowed at The Beach Rose. All amenities available. We stayed during one of Maines heat waves. The cross breeze between the ocean and cove was wonderful with the scent of the rugosa / beach rose right outside our door. True to the line Maine, life as it should be . We hated to leave! We had a an amazing stay at The Beach Rose. Convenient location next to the beaches, general store, and working waterfront. Great sunset view from the front porch and BBQ opportunities on the back patio! Comfortably fit our group of 5. Check-In: Check-in is at our office located at 1624 Harpswell Islands Road, Orr's Island, ME 04066 between 4pm and 5pm on the date of your arrival. If you think you may be arriving later, please contact MaineStay Vacations and we would be happy to make other arrangements for you.